for work performed on Kansas construction projects. Complete & review your Kansas lien document for free in 10 minutes or less. Kansas liens, Kansas lien release, bond claims, and lien related documents at your fingertips. 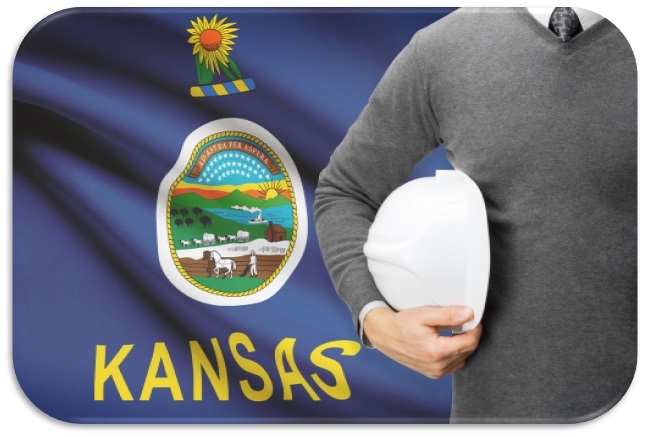 Kansas mechanics liens for labor and materials are important tools for the contractor, subcontractor and supplier on construction projects. Kansas lien law provides specific protection, and specific requirements for those who work on a construction project and have not been paid. These requirements can be difficult and confusing to get right, so to make it easy, LienItNow.com prepares, files and serves Kansas construction mechanics liens for labor and materials. In Kansas, liens for labor and material that are filed on private property or on funds relating to a public project are known as Mechanic’s Liens. These Kansas liens (also known as Kansas Construction liens), attach to the property on which the work is being performed, and use it as security for payment of the claimed amount. When a Kansas lien is filed with regard to work performed on privately owned property, it attaches to and encumbers the fee simple ownership of property, so if there is a sale or refinance, the lienor is paid from those proceeds. Additionally, a lienor can move to foreclose on the property, force a sale, and get paid from the sale proceeds. A lien release in Kansas is required to be filed in order to remove a mechanic's lien for labor and material that has been filed on a property or construction project. Similar to construction liens, lien releases are filed with the district court clerk's office in which the lien was filed, and recorded. The effect of the lien release is to remove the encumbrance that the Kansas mechanics lien for labor and materials placed upon the property. The lien release for Kansas, once recorded, once again allows the property to be sold, financed, refinanced or otherwise transferred without a cloud on the title. Prior to the filing of a lien release, Kansas properties that have a mechanics lien for labor and material recorded are difficult to sell, because in most circumstances the sale would require that the construction lien be paid out of the proceeds of the sale. Understanding why a Kansas lien release should be filed: The reasons for filing a lien release are many. Primarily, a lien release is filed when payment is made representing the amount claimed to be due in the construction lien. A lien release is also filed if a Notice of Intent to Perform has been paid in full. When payment is made for the amount claimed, there is no longer any reason for the construction lien to continue to encumber the construction project, and as a result a lien release should be filed. Another reason for the filing of a release is that the parties agree to a partial payment of the amount claimed to be due in the construction lien: in other words, the amount contained in the construction lien is disputed, and the parties settle on an alternate amount. If the parties agree that the alternate amount resolves the Kansas lien claim, then a lien release should be filed. An order from a court requiring the filing of a release is also a reason to file the lien release document. The expiration of a Kansas construction lien may also result in a requirement that a Kansas lien release document be filed. If a claimant has not foreclosed on its lien claim within the required period of time, then that lien claim should be discharged by the filing of a lien release. The lien release should be signed by the claimant (the person who filed the construction lien), and should be filed with the district court clerk. LienItNow.com prepares, files and serves Kansas Discharges of Mechanics’ Lien Claims. Once the lienor has been paid the amount contained in its lien claim, or has come to an agreement that requires the lien claim to be removed from the property records, a Discharge of Mechanics’ Lien Claim should be filed. Click Here to File a Kansas Lien Release. Kansas a few types of pre lien notices, including a Notice of Intent to Perform, which is sent at the beginning of a construction project, and a Warning Statement, which warns the owner that lien claims may be filed in the event of non-payment. LienItNow.com prepares, files and serves Kansas pre-lien notices (Warning Statement). Kansas's prelien notices include both a Warning Statement and a Notice of Intent to Perform, which is filed on new residential projects. Click Here to File a Kansas Warning Statement or Notice of Intent to Perform. LienItNow.com prepares and serves Kansas Stop Notices. A Stop Notice is a notification that has the ability to enhance the effectiveness of a mechanic’s lien. A Stop Notice, or a notice to withhold funds, is sent to the company that is financing or funding the construction funds for a project. Once that company receives the Stop Notice, that company has notice that it should withhold sufficient money to satisfy the stop notice claim. The purpose of the Stop Notice is to provide the lender, financiers or funders of the construction project notice that there is money owed to a contractor, subcontractor or supplier so that an inquiry can be made as to why that money is not being paid. Click Here to File a Kansas Stop Notice. LienItNow.com prepares, files and serves Kansas Amendments to Mechanics’ Lien Claims. Amendments to a mechanics’ lien claim are often needed when something about the claim changes. Common changes to a lien claim are increases or reductions in the amount due to the lienor, or a change to the last date of work. Click Here to File a Kansas Lien Amendment. LienItNow.com prepares, files and serves notices of extension to file mechanics’ lien claims. The filing an extension of the mechanics’ lien claim permits the claimant an extra month to file a lien claim, except for lien claims to be filed on residential property. In Kansas, the filing of a Notice of Extension to File Contractor Lien and a Notice of Extension to File Subcontractor Lien are required to extend the time to file a lien claim, but do not apply to residential properties. Click Here to File a Kansas Notice of Extention to File Lien. LienItNow.com prepares, files and serves Kansas Bond Claims. Bond claims can only be filed on a project where the owner, contractor or subcontractor has obtained a payment bond to ensure that every contractor receives payment for the work performed on the Project. The payment bonds issued by sureties for construction projects have specific timing requirements, but most require claimants to submit claims against the bond within sixty to ninety days from the claimants’ last date of work. Bond claims are as or more effective than a lien claim because the payment bond acts as a guarantee that payment will be made for work properly completed. Click Here to File a Kansas Bond Claim. More questions? Visit our Kansas mechanics lien FAQ page.